Isn’t it interesting that you believe you are a good listener and know hardly ANYONE ELSE who is? Most everyone thinks they are a good listener. They probably can’t picture themselves needing undefined or heaven forbid--buying, a self-help book on listening. Sound familiar? Most leaders think they are good listeners. Jon’s mission is to change the way leaders listen so organizations can have more effective conversations. Why do today’s great leaders need to be great listeners? Because those who listen effectively are perceived to be more strategic, collaborative, and empathetic--all traits that ultimately influence others to follow them. Join us to learn What listening really is and a practical way to quickly improve that skill. Learn how to take your random collection of listening behaviors – many of which are ineffective – and transform your ability with focus on the one powerful behavior that assures people you are listening to them. Learn the three characteristics of the one behavior which have the most potential to change the way you relate to others. Your listening skills will make a difference in your organization. And you will walk away knowing the value of effective listening and the abilities to help others including the ability to work with cross functional teams. 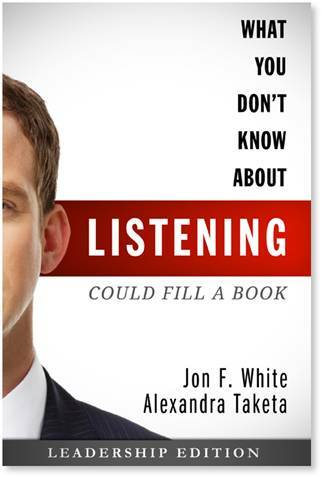 Jon F. White, co-author of What You Don’t Know About Listening (Could Fill a Book), began his career as an educator; not surprisingly, his subject was Communications. Then he moved on to build a small chain of travel agencies, later sold for ten times his initial investment. Jon followed that with 20 years as a successful top-level business leader in the medical device industry. Mr. White now infuses his work as an Executive Coach, Leadership Consultant, and valued Speaker with the practical knowledge he brought from each of his past experiences. Jon has worked with senior leaders throughout North America, Europe, the Middle East and Asia and has consulted for a wide range of companies, including Pacific Life, Qualcomm, Jenny Craig, Disney, Black and Decker, Callaway Golf, Chrysler, Kinder Morgan, Ingram Micro, Fieldstone Communities, Quest Diagnostics, and State Street Financial, to name just a few. With a passionate interest in the behaviors necessary to provide outstanding leadership, Jon’s professional journey has led him to focus on Listening because he believes it to be the skill that is fundamental to almost all other leadership attributes. Jon holds certificates in Leadership Effectiveness Analysis, Personal Directions, and Strategic Directions from Management Research Group and the MBTI from the Center for Applications of Psychological Type. He is a graduate of the State University of New York College at Oneonta and received his Executive MBA from Rensselaer Polytechnic Institute.